Released in November, 2012 by Shout! 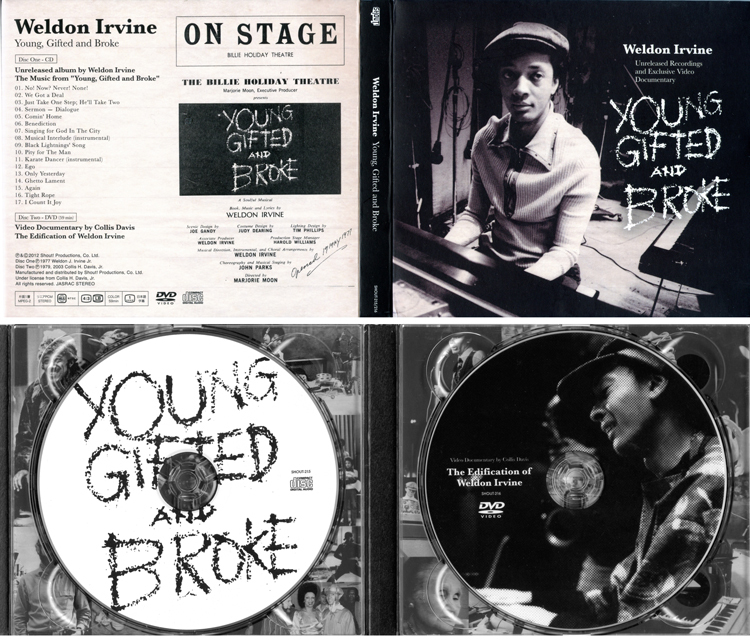 Productions of Japan, this double-disc set is a ground-breaking production due to its inaugural release of the entire sound-track of the musical, “Young, Gifted and Broke”, plus the re-release of the 60-minute video documentary “The Edification of Weldon Irvine” with Japanese subtitles. The musical’s lyrics have been completely transcribed in English and Japanese, and the two-disc set features a 12-page booklet with essays and the complete textual and visual discography in Japanese of Irvine’s recorded works and sessions in which he performed as a sideman. The audio tracks of the documentary remain in English. The crew behind this brilliant production are Ken Tsukamoto, Yusuke Ogawa and Nakata Ryo. Click here to purchase this collectors item from Amazon, Japan. Click here for the English version of Amazon.Japan. 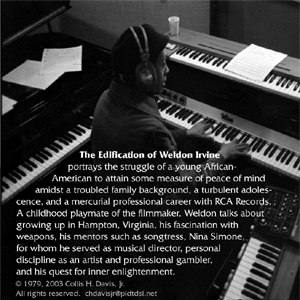 A Master of Fine Arts thesis film project (New York University Graduate Institute of Motion Picture and Television Production, 1975), The Edification of Weldon Irvine is a 60-minute, 16mm documentary of the jazz musician and playwright. Produced, written, directed and edited by Collis Davis, the film takes the audience through a journey in the life of Irvine from his childhood days in Virginia to the late ‘70s in New York. The Edification of Weldon Irvine portrays the struggle of a young African-American to attain some measure of peace of mind amidst a troubled family background, a turbulent adolescence, and a mercurial professional career with RCA Records. A childhood playmate of the filmmaker, Collis Davis, Weldon talks about growing up in Hampton, Virginia, his fascination with weapons, his mentors such as songstress, Nina Simone, for whom he served as musical director, personal discipline as an artist and as a professional gambler, and his quest for inner enlightenment. For more detail on Weldon Irvine’s life, please click here for an article written by Collis Davis for the Program Booklet of the 41st Hampton Jazz Festival of 2008. What a fascinating documentary. I obviously bought it out of interest in Weldon Irvine, and I apologize that going into it and knowing it was a student film, my expectations were not that high. But I was completely captivated throughout its entirety. You did one hell of a job capturing the essence of your subject in this film. It is a timeless piece on a timeless musician, and I think that more people should know about it and see it. Very moving and very inspiring, and probably one of the best music documentaries I have ever seen. Well done! Thank you very much. 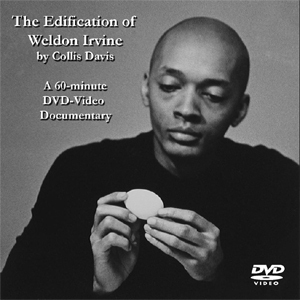 The Edification of Weldon Irvine DVD, an all-region NTSC video, is available for purchase directly from the filmmaker for $20 + $5.00 for a total of $25.00 to cover international shipping & handling.